Edraw has selected some of the most important technical tools and corresponding templates which a Six Sigma team member might need as they progress through the DMAIC methodology. All six sigma templates are ready to use and available to customize. You don't have to be professional in diagram designing. Simply choose a ready-made six sigma template and edit with you own information. Through easy-to-use tools and abundant pre-built symbols, Edraw helps users achieve best diagram design result with the least effort. When finish, you can easily covert the document to word, ppt, pdf and many other graphic formats with only one click. SIPOC is a six sigma visual tool to document business process from beginning to end. It's a high-level process map indicating only major processes, activities, and tasks. In six sigma, this typical method is widely used during the define phase. In Edraw, abundant ready-made sipoc diagram templates are available for you to choose. You don't have to waste much time in designing diagrams, but focus on more important things. Easy to design your own unique sipoc diagrams using pre made list shapes. To find the original vector SIPOC files and explore more templates, please go to the main Templates menu of this website, and browse under Flowchart -> Process category. Value stream mapping is a lean manufacturing or lean enterprise method used to document, analyze and improve the flow of information or materials required to produce a product or service for a customer. Value Stream Maps reflect a broad view of the process, usually from external supplier to external customer at a given facility. It's used for high-production, low-variety product mixes with few components and subassemblies and dedicated equipment. 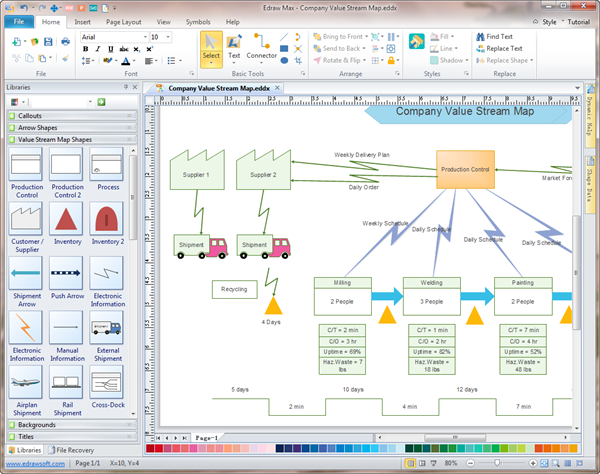 Edraw allows you to build professional-quality value stream map quickly and easily from templates. Extensive pre-built shapes and connectors will save you plenty of time in your value stream map design. To find the original value stream map files and explore more resources, please go to the main Templates menu of this website, and browse under Business -> Value Stream Map category. Cause and effect diagram is a basic yet powerful six sigma tool for root cause analysis. It's used to capture different ideas and discover potential factors. In six sigma, it's broadly used during analyze phase. In Edraw, a great number of pre-made cause and effect diagram templates are available in use. They are vector-based files which you can easily customize and redesign. Besides, our theme tool allows you to apply different color palettes to your cause-effect diagram instantly. To find the original cause and effect diagram files and discover more templates, please go to the main Templates menu of this website, and browse under Business -> Fishbone Diagram category. A scatter plot, also called a scatter diagram, is a basic graphic tool that illustrates the relationship between two variables. Six Sigma scatter diagrams and their correlation analyses are indispensable tools during Analyze phase. Through Edraw, you can generate a scatter chart in just seconds by importing a data file. In addition, many customization options, such as set tick numbers, hide data labels, change marker size, and etc., can be done with one or two clicks through action button. It's incredibly fast and easy. Get free scatter chart templates from our templates gallery. To find the original scatter plot diagram files and discover more materials, please go to the main Templates menu of this website, and browse under Chart -> Charts and Graphs category. In Six Sigma for process design, it's very important to first identify the various tasks in that process then identify the roles (people or groups or departments) and finally their responsibilities for a given task. And at this time you need a RACI matrix to present the responsibilities and accountabilities of each person. Below are some of the RACI matrix templates made by Edraw. You can get these templates through the Templates page, Chart and Graph unit. Or if you want to make your own unique style, simply open Edraw and click Six Sigma Matrix or Relationship Matrix icon under Business category, with pre-made matrix boxes, you will finish a high-quality RACI matrix in just minutes. To find the original RACI matrix diagram files and discover more templates, please go to the main Templates menu of this website, and browse under Chart -> Charts and Graphs category. PDCA (plan-do-check-act) cycle, which is also known as Deming Cycle, is a continuous quality improvement model proposed by W. Edwards Deming in the 1950's. It can be used as a six sigma tool for process improvement. Here are some ready-made PDCA templates provided by Edraw to assist with your PDCA plan. Make a beautiful PDCA diagram that you can print and share in minutes - even if you've never created one before. To find the original vector PDCA files and explore more templates, please go to the main Templates menu of this website, and browse under Flowchart -> Process category. Quality Function Deployment (QFD) is a set of powerful product development tools that captures customer requirements and translates those needs into characteristics about a product or service. Using a ready-made QFD diagram template can greatly ease your drawing process. Through Edraw, it only takes a few seconds to choose a basic template, insert your own text and symbols, and add the finishing touches. Try this great QFD software, and you will surely like it. To find the original vector QFD files and explore more templates, please go to the main Templates menu of this website, and browse under Business-> Schedule category. DMAIC model is the roadmap for six sigma process. It's an integral part of a Six Sigma initiative, but in general can be implemented as a standalone quality improvement procedure. Get free customizable DMAIC templates from the Template page, Process unit. To find the original vector DMAIC files and explore more templates, please go to the main Templates menu of this website, and browse under Flowchart -> Process category. Brainstorming is an indispensable tool for six sigma process during analyzing and improving phases. Many tools can be used to document brainstorming results. Here are three typical ones: brainstorming diagram, affinity diagram and fishbone chart. All templates are available to download and customize through Edraw. Download this powerful diagramming software and use thousands of great looking templates for free. To find the original vector brainstorming files and explore more templates, please go to the main Templates menu of this website, and browse under Business-> Brainstorming category.